... is scheduled as the guest speaker for the 211th meeting of the Karl Hess Club, to convene on January 16, 2012. Bob Weber on "Three Conspiracies: Two I Don't Believe in and One I Do"
Join us on The Night of January 16th for another evening of Conspiracicity. Last month, Don Meyer gave us a compelling and challenging presentation on what might really have happened to WTC Building 7 on 9/11, and related topics. Now comes Bob Weber with his thesis on three conspiracies. Bob will explain why some so-called conspiracy theories are just that, while others are unfounded notions which can be debunked, and still other conspiracies are obvious and rarely even secret. As examples, he will discuss two conspiracy theories he doesn't believe in -- and one that he does! Bob is one of the Karl Hess Club's most devoted members, having had a perfect attendance most years since 1994 -- and is also one of our most frequent speakers. He is our "go to" guy on many subjects. If we are ever in a "pub quiz" he will be our team's Center -- and not just because he's tall! 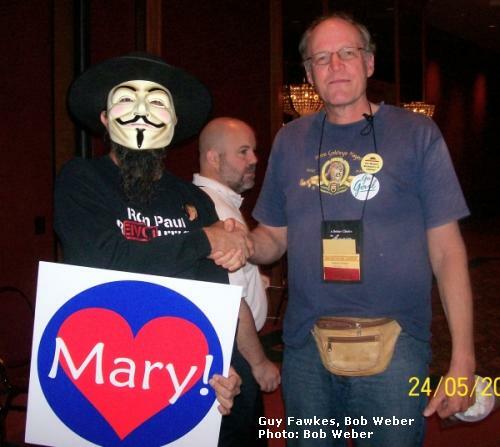 Bob Weber is a veteran of the freedom movement. In 1964, he cajoled his parents into taking him to Dodger Stadium for Barry Goldwater's campaign speech. He has run for political office many times, with a perfect record of never having been elected. He served as L.A. County Chair of the LP, was twice the state LP's Southern Vice-Chair, and is currently a member of the state LP's Judicial Committee. Bob is also the most recent recipient of the Samuel Edward Konkin III Memorial Chauntecleer, the KHC's award for Excellence in Agorism.